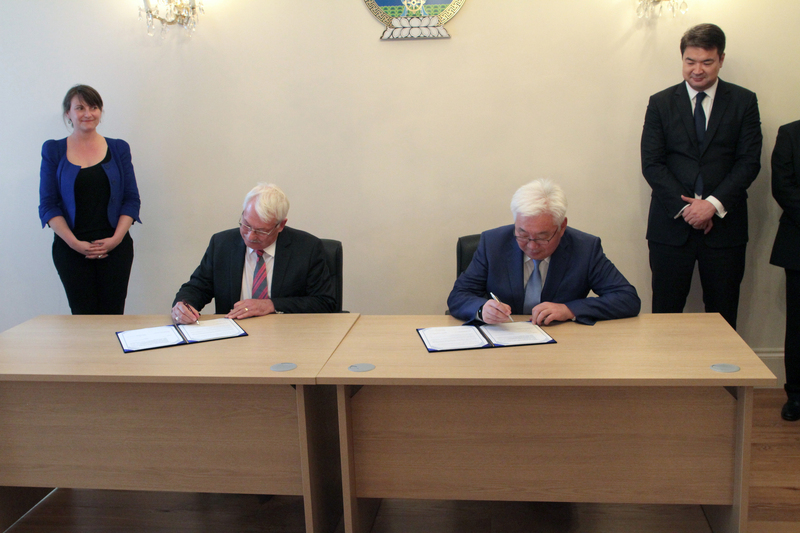 03/07/2015, London – Mayor and Governor of Ulaanbaatar, Bat-Üül Erdene and Professor Peter Head CBE, Founder and Chief Executive of The Trust sign a Memorandum of Understanding, in the presence of Prime Minister Chimed Saikhanbileg of Mongolia, to work in partnership delivering smart, resilient and sustainable development for the people of Mongolia. 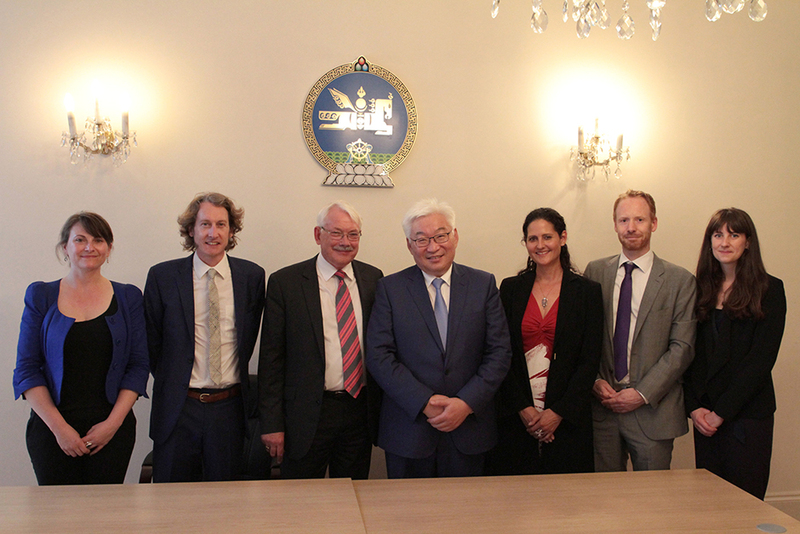 The Trust, a UK charity, has been working in Ulaanbaatar since December 2013 supported by the Foreign and Commonwealth Office (FCO) British Embassy of Mongolia and Future Earth Ltd to create an integrated, urban-rural, systems data platform called resilience.io. This tool will enable cities to plan and evaluate the business case for investment in projects that bring improved human wellbeing, resource efficiency, clean energy and renewable technologies which restore ecological and freshwater systems and secure the production of safe food. Ulaanbaatar is an important engine of growth and development for Mongolia which faces many challenges due to rapid urban expansion, such as pollution, overloaded infrastructure and inequality. Its development strategy envisions a city with a competitive and diverse economy, a healthy environment, and a population alleviated of poverty by 2030. A key issue will be finding affordable housing and infrastructure solutions for 60% of the population living in the informal “ger district”. resilience.io will enable the city to aggregate investments into a new Urban Development and Investment Fund, set up to support projects that maximise long-term economic, environmental and social benefits in the region. A world-class team of scientists, engineers, planners, social and political experts and economists has been brought together to support the work, which is part of an ambitious global programme to transform to a more sustainable, resilient global economy. New international policy frameworks on disaster risk management, sustainable development and climate change will be agreed this year. The Trust’s approach, detailed in the report, ‘Smart ways to mobilise more efficient and effective long-term investment in city regions‘, will be presented as a way of bringing forward investment in sustainable projects at the Third International Conference on Financing for Development (FfD) in Addis Ababa in July and at the Climate Change Conference of the Parties in Paris in December. The Trust is a member of the R!SE Initiative which is led by the United Nations Office for Disaster Risk Reduction (UNISDR). The resilience.io platform is considered a leading example of a practical approach to catalysing the shift from managing disasters to managing risks aligned with the objective of the R!SE Initiative to create risk-resilient societies by making all investments risk-sensitive. When I created The Trust, four years ago, the aim was to provide all regions of the world with an open-source, free-to-use platform that would enable them to discover a more resilient, sustainable development pathway – a resilience compass. To do this we had to bring together world-leading modellers in human, ecological systems and economics. However it was also necessary to find regions in different parts of the world with the leadership and desire to bring about transformational change for their people and willingness to use this platform for that purpose. In particular to use the platform to help meet the post 2015 Sustainable Development Goals (SDGs) and to attract investments that seek lower risk through new governance and data systems. The UK Foreign and Commonwealth Office and Department for International Development (DfID) have given us excellent support to realise this ambition. It has been a great pleasure to work with Mayor Bat-Uul over the last year and to arrive at today’s historic agreement to work together for the next three years. Ulaanbaatar joins the city of Accra and the UK County of Dorset as demonstration regions with another planned in China.